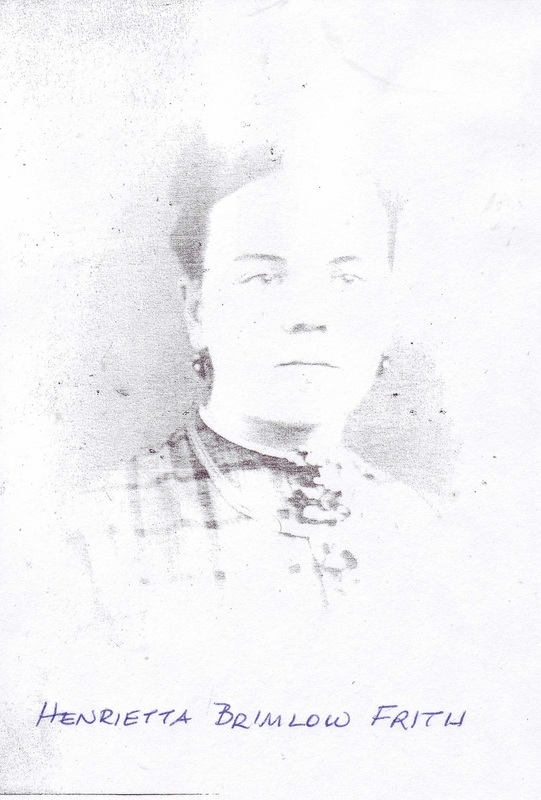 In an earlier series of posts, I talked about Henrietta “Nettie” Ella (Frith) McLean and the fact that she married her first cousin George E. McLean (1867-1915). I’ve also covered much of the McLean line and in that process, I wrote about George’s mother, Susan Wynn (Frith) McLean (1839-1915). Now I need to do a quick clean up on the rest of Frith line before moving on to the Browns and Brimlows. For those who need a reminder of who’s who, here’s a link to the MacLean, Frith, and Brimlow Pedigree Chart. Today we’re going to take a look at the family of person #6 on this chart, George Richard Frith. 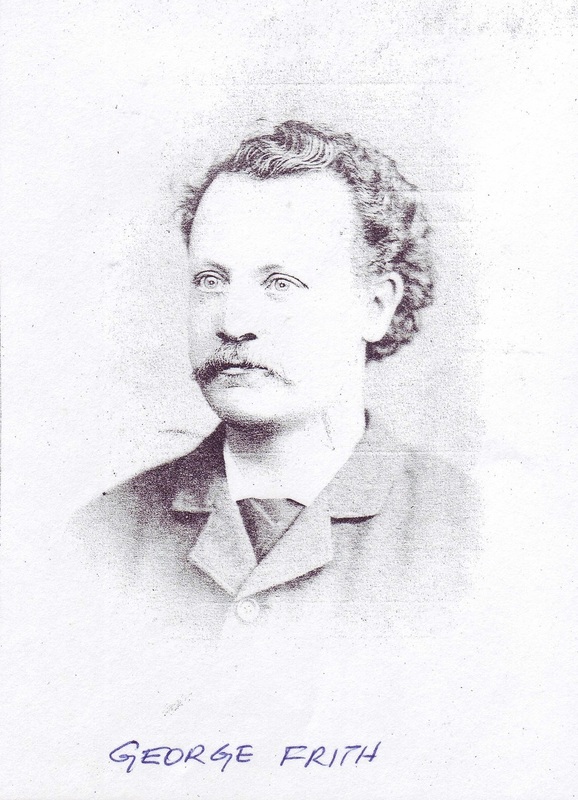 The next post will be about the family of William Frith and Frances Brown. George Richard Frith was born 7 Jan 1848 in Williamsburg, Brooklyn, Kings, New York.1,2 He was the second son, and sixth known child of William Frith and Frances Brown. His parents were both deceased prior to his seventh birthday and until the age of eleven, he and his siblings were taken care of by Ellen Winn. Her exact relationship to the family is not yet known; however, she traveled to New York with William and Frances and is buried in the Brown/Frith family plot in Cypress Hills Cemetery. It is not known where George and his siblings lived after Ellen’s death. George Richard Frith died of cirrhosis of the liver on 15 Mar 1903 in Roslyn, Nassau, New York, and was interred on 18 Mar 1903 with his wife in Cypress Hills Cemetery.11 While my initial inclination was to say he drank, it is probable that his liver issues came from spending his life working with lead-based paints. 1. Death Certificate, County of Nassau-State of New York, Registration #3270, George Richard Frith, Date of Death 15 March 1903, Age 54 y 2 mo 8 d., Father William Frith, mother Frances Brown. Cit. Date: 14 May 2014. 2. 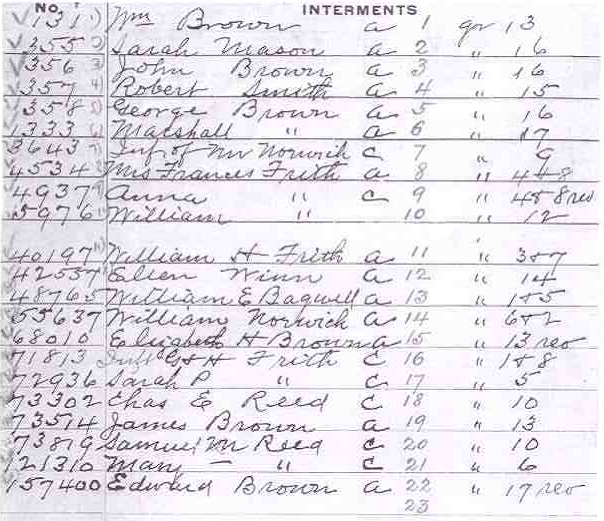 1850 U.S. census, population schedule, Williamsburg, Brooklyn, Kings, New York, p. 265B, dwelling 1202, family 2135, George Frith, age 2; digital images, Ancestry (accessed 12 May 2014); citing National Archives and Records Administration microfilm M432, roll M432 522. Cit. Date: 12 May 2014. 3. Cypress Hills Cemetery (Brooklyn, Queens, New York), Plot Records, Sec 2, Lot 161. 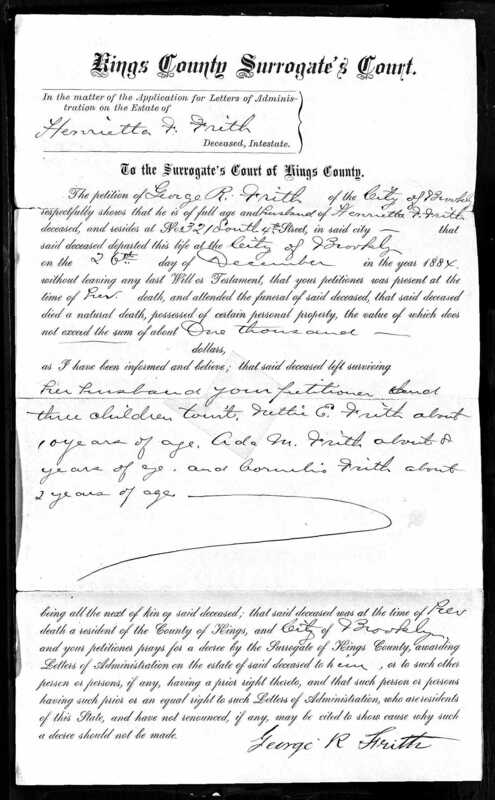 Plot record states infant child of G & H Frith – no age. Cit. Date: 13 Aug 2010. 5. Cypress Hills Cemetery (Brooklyn, Queens, New York), Plot Records, Matthew Frith, interred 25 Aug 1882, Child. Sec 6, Lot 596, South 1/2. Cit. Date: 3 Aug 2010. 6. 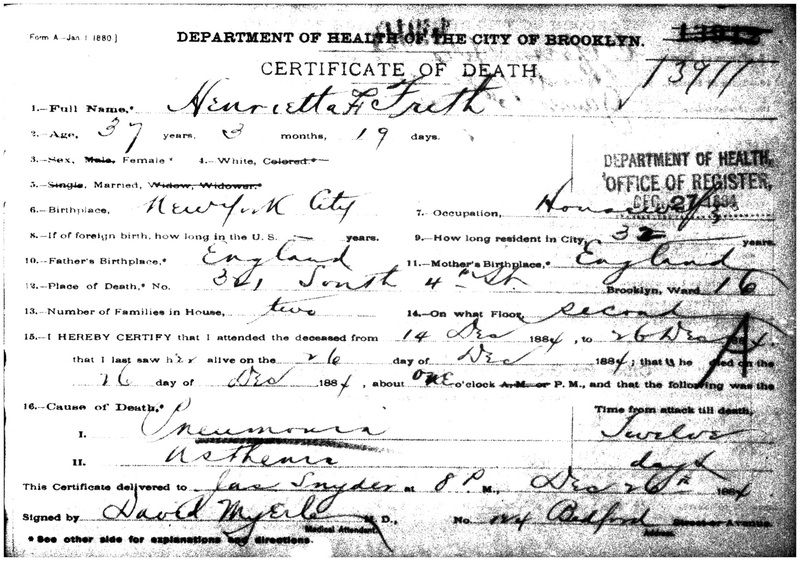 Kings County, New York, death certificate no. 13911 (26 Dec 1884), Henrietta F. Frith; FHL microfilm 1,323,798. Cit. Date: 2 Aug 2010. 7. 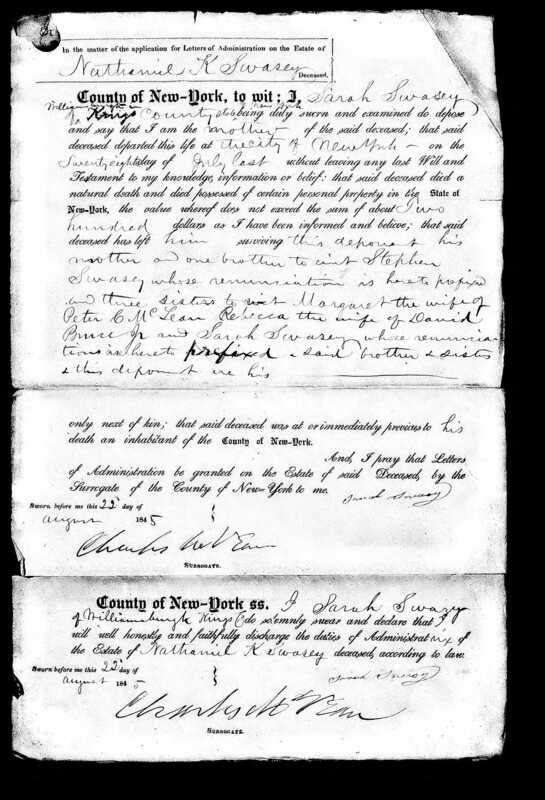 New York, Kings County, Probate Administration Records; Author: New York. Surrogate’s Court (Kings County); Probate Place: Kings, New York, Henrietta F. Frith, 29 Dec 1884. 8. 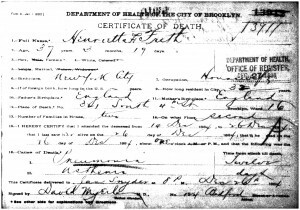 “New York Death Records,” database(accessed 27 Oct 2015), Cornelia M. Frith, 14 Mar 1886, Brooklyn, Kings, burial Cypress Hills. 9. New York, population schedule, No. Hempstead, Queens, 2 E.D., p. 2, line 16, George Frith; digital images, Ancestry (accessed 14 May 2014). Cit. Date: 14 May 2014. 10. 1900 U.S. census, population schedule, No. 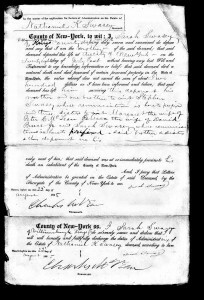 Hempstead, Nassau, New York, enumeration district (ED) 711, p. 4B, dwelling 77, family 82, McLean, George E.; digital images, Ancestry (accessed 11 May 2014); citing National Archives and Records Administration microfilm T623, roll 1079. Cit. Date: 11 May 2014. 11. Death Certificate, County of Nassau-State of New York, Registration #3270, George Richard Frith, Date of Death 15 March 1903, Age 54 y 2 mo 8 d., Father William Frith, mother Frances Brown. Cit. Date: 14 May 2014. Brick Wall… What Brick Wall? Margaret Swasey b. abt 1806 in Massachusetts is the proven wife of Peter Charles McLean based on census records and being named in her daughter Sarah Amelia’s death records. Margaret was our brick wall for many years. We knew that Margaret had married Peter circa 1829/30 based on the age of their first child Charles Edward born 1830/31. Peter C. McLean was found on the 1830 Federal Census in Ward 7 New York as a male 20-29 with a female 20-29 presumed to be Margaret prior to the birth of Charles. Everything I knew about Margaret was posted on 24 Jun 2014. With the release of the wills and probate on Ancestry, I did a routine search for the name of Swasey in New York prior to 1860. Margaret Swasey McLean died in 1854 so I was hoping to find a father who had named her or her children in a will. 1803 – 23 Feb 1803 Sarah “Sallie” Leigh and Samuel Swasey marry in Newburyport, Essex, Massachusetts.2 There are multiple records for their marriage on 14 Jul 1803, but the record from the New England Genealogical Society is the one with the earlier date and is consistent with the recorded birth of their first child Stephen in Dec 1803. Examination of the original record is now on my To-Do list. 1814 – Samuel offers $20 reward for a runaway indentured apprentice, Albany Argus, 7 Jan, p4. 1815 – Samuel’s property is sold by the Sheriff at auction in Albany – Albany Gazette, 20 Feb, p4. 1817 – Samuel Swasey appears in the New York City list of letters – National Advocate for the Country, 3 Jan, p2. 1822 – Mrs. Sarah Swasey appears in the list of letters – Albany Argus 4 Oct 1822 p3. 1829 – Sarah Swasey first appears in the city directory running a boarding house in New York City. 1830 – Sarah Swasey is found on the 1830 Federal Census in New York Ward 45 – the city directory of the same year indicates she is running a boarding house.6 This is the same ward that daughter Margaret McLean is living in. 1840 – Samuel Swasey (age 20-29) along with an older woman (40-50) is found in Ward 7 – this is the same Ward as Peter McLean. The age is appropriate for Sarah. When I received the plot list for the Bruce family plot in Cypress Hills it noted that Nathaniel Swasey (age 28) was interred in this plot along with Samuel Swasey (age 29) and John Bruce (age 42) on 28 Apr 1848. No death dates were shown, but we know that Nathaniel died in 1845, so these 3 individuals were obviously reinterred from elsewhere. We also know this Samuel must be a son, as the father Samuel b.1781 would have been about 44 when last found in 1825. The Samuel and Sarah (Leigh) Swasey family (based on the above information) is up on Ancestry and FamilySearch now. Seeing all the Bruce names now explains where some of the names used by both Peter Charles and Peter Byron McLean came from. They had a ton of Bruce cousins and the family was very well off. There is much more research to do in proving the line back, but at least I know where to look now. And all because of this one document. Happiness is surveying a pile of rubble that was once a brick wall. 1. Letters of Administration for Nathaniel K. Swasey named mother Sarah Swasey, sister Margert McLean, Rebecca Bruce, Sarah Swasey, and bother Stephen Swasey of Albany; digital images (accessed 12 Sep 2015). 2. Marriage Record, The New England Historical and Genealogical Register. Boston: vol 0943, p64. The New England Historic Genealogical Society. 23 Feb 1803 Samuel Swasey – son of Stephen Swasey & Abigail Knapp to Sarah Leigh father Benjamin Leigh. Cit. Date: 12 Sep 2015. 3. 1810 U.S. census, Albany, Albany, New York, p. 62, Sam Swasy; digital images (accessed 12 Sep 2015); citing National Archives and Records Administration microfilm M252, roll 26. 4. City Directory, Swasey, Samuel, morocco dresser, New York: p.472; digital images accessed 12 Sep 2015. 5. 1830 U.S. census, New York Ward 4, New York, New York, p. 216, line 13, Sarah Swasey; digital images, Ancestry (accessed 12 Sep 2015); citing National Archives and Records Administration microfilm M19, roll 96. Cit. Date: 12 Sep 2015. 6. City Directory, , Swasey, Sarah, boarding-house 209 William, New York: p.572; digital imagesaccessed 12 Sep 2015. Cit. Date: 12 Sep 2015. 7. U.S., Newspaper Extractions from the Northeast, 1704-1930, New York Evening Post. 8. Burial Record, Cypress Hills Cemetery, Brooklyn, Lot 226, Sec 2, Owner David Bruce Sr. Interment #187370 Sarah Leigh Bruce 1 Nov 1924. 9. 1850 U.S. census, population schedule, Williamsburgh, Brooklyn, Kings, New York, p. 307B, dwelling 1631, family 2772, Sarah Swazey in home of David Bruce; digital images, Ancestry (accessed 12 Sep 2015); citing National Archives and Records Administration microfilm M432, roll M432 522. Cit. Date: 12 Sep 2015. 10. Burial Record, Cypress Hills Cemetery, Brooklyn, Lot 226, Sec 2, Owner David Bruce Sr. Interment #5249 Sarah Swasey 11 Sep 1854. I need to preface this with the reminder that every family has stories – whether these tales have any basis is truth is often a matter of perspective. The following came from what I was told when growing up and later conversations with extended family members during my research. I only knew my grandaunt Sue for a short time. We both lived in Reno in the mid-1970s, and I visited with her several times. She was a very sweet lady who reminded me a lot of my grandmother Margaret. Most of the family stories I heard about Susie began with “Poor Sue.” I think her siblings felt Susie had had a pretty rough road in life. The “Poor Sue” seems to begin with the death of her husband John Kelley. By all accounts, she loved him very much and his sudden death was shattering. Susie was pregnant at the time and she and her infant daughter (also named Nettie) moved back in with her mother. John Kelley’s son John Stewart Kelley was born in his grandmother’s home three months later. Her mother Nettie fired the maid and Susie picked up her duties to pay her way. It’s my understanding that Nettie never missed an opportunity to let her daughter know how “lucky” she was to have a place to go.